Dr. Jay Heidecker graduated the medical school from the University of South Alabama College of Medicine and completed both his residency and fellowship program at the Medical University of South Carolina. He is specialized in pulmonology and also board certified in sleep medicine, pulmonary disease, and critical care medicine. 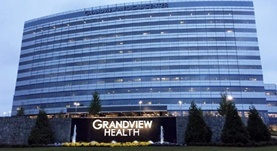 Dr. Heidecker has been in practice for more than 11 years and is affiliated with Grandview Medical Center. Furthermore, during his career, he has published several writings of medical interest in collaboration with other doctors. Dr. Jay Heidecker has contributed to 3 publications. Pathophysiology of pneumothorax following ultrasound-guided thoracentesis. Heidecker, J., Huggins, J. T., Sahn, S. A., Doelken, P.; Chest. 2006 Oct.
Characteristics of trapped lung: pleural fluid analysis, manometry, and air-contrast chest CT.
Huggins, J. T., Sahn, S. A., Heidecker, J., Ravenel, J. G., Doelken, P.; Chest. 2007 Jan.
Pleural effusion caused by trapped lung. Heidecker, J.T., Judson, M.A. ; South Med J. 2003 May.